Why Would Anyone Buy a Street Fighter IV HDTV? 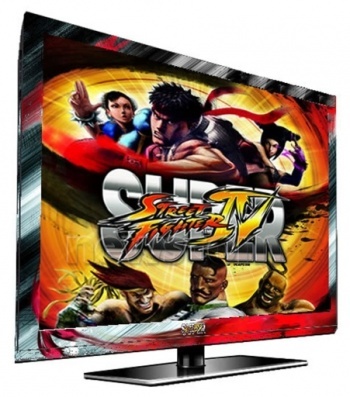 In case Super Street Fighter IV tournament sticks just weren't extravagant for you, you could always shell out the dough for a 46" SSF4-themed HDTV. Now, don't get me wrong - I love me some Street Fighter. I just don't love it enough to throw down $150 on branded arcade sticks. But there are some people who do, and I won't hold that against them. If you happen to be one of those people who really, really loves Street Fighter, and you have a lot of disposable income burning a hole in your pocket, why not take a step up and upgrade: Get a Street Fighter IV HDTV. Created by Roundtable Concepts - who also made a Marvel Comics-themed series of TV sets - these LED HDTVs will come in four sizes: 32″, 40″, 42″ and 46″. The border of the TV Will be covered in Street Fighter art, and the TV itself will display eight seconds' worth of Street Fighter IV images when turned on. No pricing has been announced yet, but ... really, do you guys know anyone who would buy something like this? Sure, it looks cool-ish, and the SF4-themed boot-up is kind of nifty, but it just seems so unnecessary. At least a fighting stick helps you play better competitively (in theory). Frankly, I can't see this being worth the investment unless the TV itself throws a Hadouken at you every time you turn it on. And I don't mean an image of a Hadouken, I mean the real thing. Then it might be worth it.